Skyharbour Resources (TSX-V: SYH) (OTCBB: SYHBF) would like to bring to your attention Purepoint Uranium’s news release (below) this morning announcing a drill intercept of 31.2 metres of 1.7% EU3O8 at its Hook Lake Joint Venture Project owned jointly by Cameco Corp. (39.5%), AREVA Resources Canada Inc. (39.5%) and Purepoint Uranium (21%). This is yet another high grade zone discovered on the prolific Patterson Lake trend and demonstrates how robust and pervasive the mineralizing events were at this district. 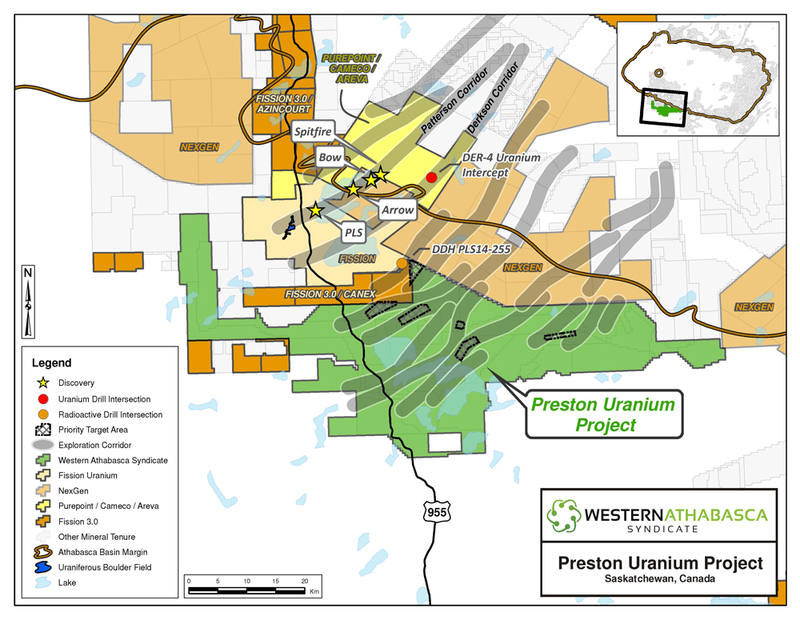 This is very bullish for the surrounding region with Skyharbour owning a 50% interest in the Preston Uranium Project in the Patterson Lake area. Skyharbour and its JV partner, Athabasca Nuclear, recently released a NI 43-101 Technical Report on the Preston Project (see news release dated Feb. 18, 2016). The large-scale Preston project is strategically located near Fission Uranium Corp.’s shallow, high-grade Triple R deposit and is adjacent to NexGen Energy Ltd.’s Rook-1 project hosting the Arrow uranium discovery in the Patterson Lake region of northwestern Saskatchewan. The project comprises 34 contiguous mineral claims in good standing and totaling 121,148 ha intersected by all-season Highway 955. More than $4.7 million in exploration has been conducted over the past two and a half years resulting in fifteen high-priority drill target areas located within eight prospective exploration corridors. First-pass drilling at Preston intersected encouraging early stage results including elevated radioactivity with additional drilling recommended. Graphitic and non-graphitic metapelitic gneisses and felsic intrusive rocks were commonly intersected and were frequently affected by significant structural disruption, hydrothermal alteration and returned anomalous pathfinder geochemical results in nearly all the drilled holes. The aforementioned characteristics are features commonly associated with structurally controlled uranium deposits. Purepoint Uranium Group Inc. (TSX-V: PTU) had intersected the strongest mineralized interval drilled to date within the Spitfire zone by hole HK16-43 returning downhole probe results of 1.7 per cent equivalent triuranium octoxide over 31.2 metres, including 13.3 per cent eU3O8 over 2.2 metres. Purepoint is the operator of the Hook Lake project on behalf of its joint venture partners, Cameco Corp. and AREVA Resources Canada Inc.
-- The mineralized structure has yet to be tested where it meets the unconformity and may also be associated with unconformity-related uranium deposition. A Mount Sopris 2PGA-1000 downhole total gamma probe was utilized for reporting the low-grade mineralization as a %eU3O8 while a Mount Sopris 2GHF-1000 downhole triple-gamma probe was used for estimating the high-grade mineralization. Reported equivalent uranium grades (%eU308) are downhole calibrated gamma probe results composited by length using a cut-off of 0.05% eU3O8 and maximum internal dilution of 2.0 metres. All drill intercepts are core width and true thickness is yet to be determined. Scott Frostad, BSc, MASc, PGeo, Purepoint's Vice President, Exploration, is the Qualified Person responsible for technical content of this release.